In Newark, Fans Mourn Whitney Houston : The Record As the singer was laid to rest in a celebrity-filled funeral, fans in her hometown took to the streets to offer memories. A makeshift memorial is seen prior to the funeral services for Whitney Houston at the New Hope Baptist Church in Newark, New Jersey on Saturday. Whitney Houston came home to New Jersey this weekend. Friends and family attended a private memorial service for the pop singer at the church in Newark where she sang as a child. Houston's producer and mentor Clive Davis spoke about the string of hits she enjoyed at the beginning of her career. "Neither of us could believe the incredible worldwide explosion when it happened," Davis said. "When she broke that all-time record of seven consecutive number ones, which just felt utter disbelief. I would ask her, are you pinching yourself?" Whitney Houston never equaled that initial run of success. She struggled with addiction until her death in Los Angeles last weekend at age 48. But her fans remained loyal to the end. 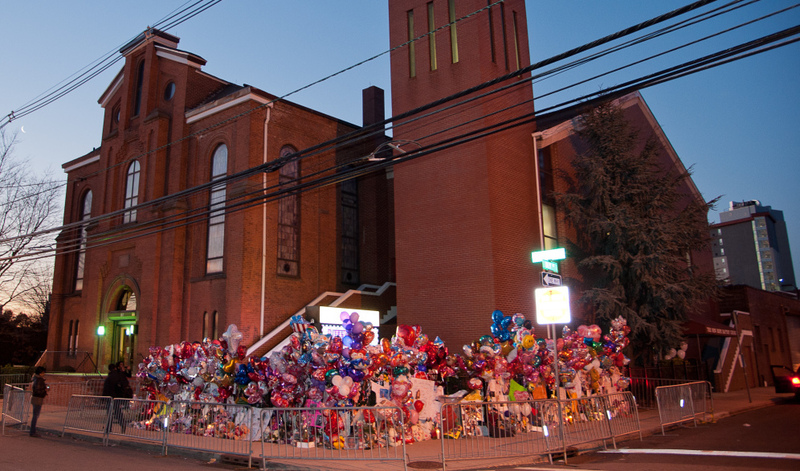 While the official ceremony was unfolding inside New Hope Baptist Church, hundreds of fans from around the country gathered in the streets of Newark yesterday to pay their respects. We asked them which of Houston's performances moved them the most. Vonda Smith of Dallas, Texas chose "The Greatest Love of All" because of lyrics like these: "If I fail, if I succeed / At least I lived as I believed." "Sometimes we need words of encouragement," said Smith. "And that song just, when I need to have inspiration, outside of gospel songs, that's one that I reach for." Monica Johnson of Newark describes herself as a huge Whitney fan. "When I think of Whitney," Johnson said, "I think about when I was in first grade, and I did a little talent show. And I wanted to pick a song. And the song I chose was 'I Wanna Dance with Somebody.'" For Edward Thompson of Newark, his favorite Whitney Houston moment doesn't appear on any of her studio albums. He points to her performance of "The Star-Spangled Banner" at the Super Bowl in 1991. 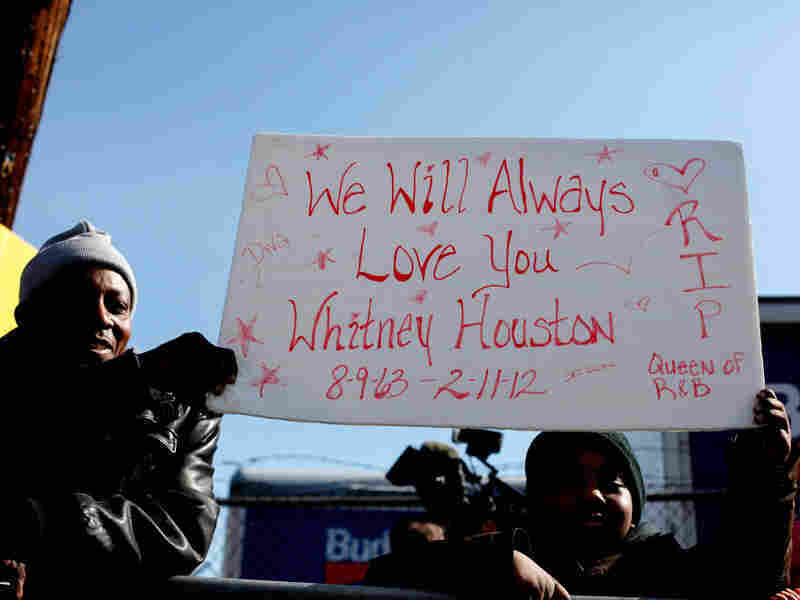 Fans mourn at the funeral service for Whitney Houston in Newark, New Jersey. "The thing about her performance that moved me was that Whitney sang with ease," says Felicia Nace of Princeton. "She didn't have like all the synthesized equipment behind her." Nace could not decide on a single favorite Houston performance, so she settled on two: "I'm Every Woman" and "I Will Always Love You." It was that second song that played yesterday as Houston's casket was carried out of the church after the memorial service.